A fan's first-hand account of Brazil's Women's World Cup win over Spain at Montreal's Olympic Stadium. MONTREAL – I was optimistic when I set off to the Olympic Stadium last Saturday to see Brazil and Spain face off in the Women’s World Cup (rooting for Brazil). I’ve been to lots of matches in South America and arrived expecting something similar. What I found couldn’t have differed more drastically from my previous experiences. In South America, the first stadia were built by neighborhood and ethnic clubs. But in the 1920s and 1930s, national governments built impressive new stadia, and they became monuments that have been at the heart of social political life for decades. They’ve been used by dictatorships as torture chambers, and been at the center of protests against those same repressive forces. Today, in many places fan groups threaten spectators with a vicious, though less political, brand of violence. While there are dangers to personal security, these spaces are eminently convivial: there is music, food, and storytelling before and after the games. I knew I would enjoy the game itself. Fans of women’s soccer have murmured to one another for years over Spain’s notable absence from the World Cup and at last, La Roja had made it. The Brazilian team, meanwhile, boasts some of the best players ever. When I’d passed the border into Canada, the immigration officer asked, “Reason for visiting Canada?” I gleefully replied, “The Women’s World Cup!” He raised an eyebrow. I had been hoping to let Canada know, officially, how proud they should be of hosting this tournament, but the officer just waved me along. In the hours before game time, I milled around expecting and ready to observe the kind of pre-game rituals, tailgating, or street food vending I’m familiar with in South America. But nothing indicated that there was a tournament going on. I walked further from the stadium, hoping for some kind of black market commerce where I get some gear for the game, but nary a Spanish or Brazilian flag could be bought. The Olympic Stadium is surrounded by a lovely park, which features the Montreal Biodome and Insectarium. My family argued that waiting around another four hours like an expectant ethnographer would be ridiculous. They convinced me that I could visit the ant exhibit at the Insectarium as homage to Formiga, the Brazilian midfielder nicknamed for the hard-working insect. The exhibit was beautiful with rare flowers covered in workaholic ants marching to and fro. Still, I thought, Formiga herself was too creative to be one of these ants. A couple of hours later, I persuaded my entourage to enter the stadium. The good news was that I didn’t feel the need to leave my children at home, as I do in South America. When I entered the stadium, I didn’t have to look for an escape route, and I hadn’t brought a scarf to ward off smoke from the flares. Obviously there are lots of safe stadiums throughout the region, but I was comparing my experience to that going to major international or club tournaments, like the Copa Libertadores. The best part of the Montreal stadium experience for me was the Fan Zone. If you are going, get ready to play some pick up. Boys and girls were pretty evenly represented and nearly everybody got in the mix. In fact what was striking about the crowd, compared to the usual soccer fan groups in Latin America, was how many girls and women there were, along with families with young children. The loudspeakers rang out bossa nova creating a hippie beach vibe that everyone could enjoy. Brazilian and Spanish fans draped in flags mingled happily. It was quite a contrast from the last game I attended in Brazil—between Ponte Preta and Corinthians—when the fan organizer demanded the young man next to me remove his shirt, since it was a neutral color. He proceeded to light it on fire and throw it at an opposing fan. Laid-back fan culture has its upsides. Game on. The first half of the game started to the sound of tepid cheers. There were plenty of Brazilian shirts, but fans in U.S. and Canadian garb outnumbered them. A family sitting close to me from Virginia Beach asked: “Who should we root for?” For me, the quiet of the crowd in the first 20 minutes seemed downright eerie. A brave Brazilian fan brought his drum, but it seemed so out of place that he clearly felt awkward. It was a defender’s game, which doesn’t always inspire a novice crowd. The Spanish defense came out strong and had clearly done their homework. They marked with precision, physically, but fairly. Brazil’s short passing game fell apart. A few lonely cries of “Vamos Espana” pierced the calm. The energy intensified and the crowd started to warm up. There were a few oohs and aahs. 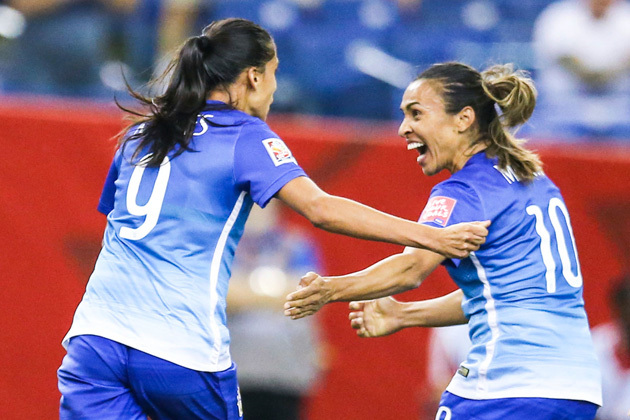 The half crescendoed with Andressa Alves’s goal in the 44th minute, which like the rest of the game, seemed to come less from inspiration than perseverance. At the half, I wandered around. The lines for popcorn and beer were long and no one seemed in a hurry. The Canadians behind me couldn’t stop talking about hockey, driving me to distraction. Just before the start of the second half, it came to my attention that the baby’s diaper would not survive until full time. Argh! Was this a feminist moment in sportswriting or a sexist one? No time to ponder. I performed my own athletic feat in the concrete facilities of the Olympic Stadium. Two minutes had gone by, but I hadn’t missed much. A couple of lovely dribbles by Marta and a near goal deflected by the Spanish kept the crowd interested. Natalia Pablos came within inches of equalizing for Spain. Raffaele of Brazil, with only six caps, deserves quite a bit of credit for running down Spanish forwards left and right. Spain’s defenders continued to short-circuit the Brazilian frontline. Cristiane looked downright frustrated. A star in her own right, with 75 international goals in 108 matches, Cristiane is not quite as speedy as Marta, but she is strong on the ball. She called frantically for a pass in the 80th minute, but Leire Landa intercepted. Inexplicably, she was subbed out in minute 89. What? I looked around for fellow outraged fans. This needed a discussion! The spectators who surrounded me weren’t anywhere near as concerned, though they seemed sympathetic enough to my consternation, and a bit worried about me. And then, just like that, it was over, Brazil had pulled it out and Spain had impressed with its skillful defense. According to FIFA, there were at least 25,000 other people at the game with me. This is over half of the number that showed up for the Canada versus Netherlands game on Monday. Not bad, Montreal! Looking ahead to the Costa Rica match, Brazil has to make strategic decisions. On the one hand, it’s great to save the energies of the veteran forwards, but the miscues from the Spain game show that Brazil still has to learn how to make adjustments. Vadao has indicated that he’ll start Alves, which makes sense, as she’s an emerging leader and quite fit. This is the first World Cup for goalkeeper Luciana and Brazil’s backline is rather inexperienced. The Costa Rica match offers a real opportunity to tighten the defense. Brazil’s midfielders were key to maintaining the majority of possession against both Spain and South Korea. Surely, Costa Rica will seek to challenge that. I didn’t get all the singing I wanted. But then again nobody was chased out of the stands. Brenda Elsey teaches at Hofstra University, and is currently writing a book with Joshua Nadel, Futbolera: The History of Women and Sports in Latin America. She is also the author of Citizens and Sportsmen: Politics and Futbol in Twentieth Century Chile​. She can be followed on Twitter @politicultura.